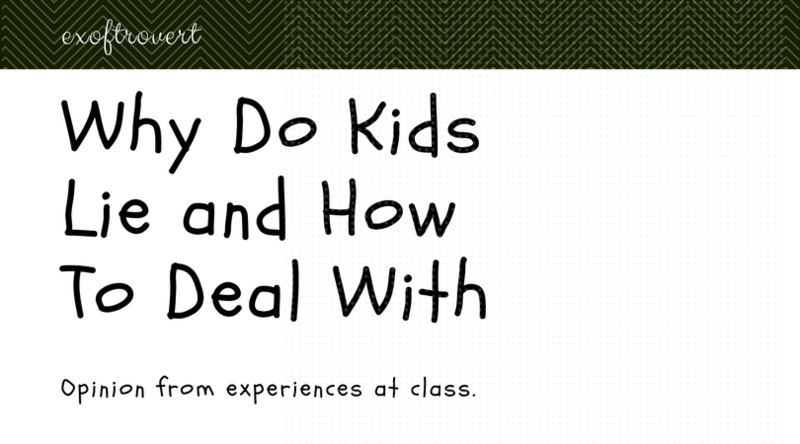 Why Do Kids Lie and How To Deal With - I always try to instill trust in my students, never prejudice that they might lie to me. So when they turn out to lie, then I feel betrayed, and it hurts me so much. I also understand that lying is normal. Lying is wrong, but still normal. Because in fact, I also lying for some things in certain circumstances to avoid something. 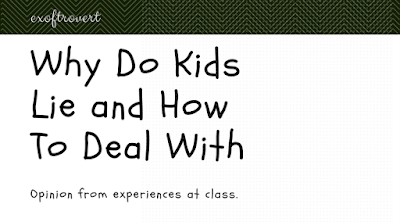 Okay, here I will assume the students are my own children. So, it should be a teacher as a second parent, especially at school. A person who has a great responsibility to them. They are trying to build an identity. Identity should show their true identity. But my students, who are still children, sometimes lie to be accepted by the people around him. For example, their new friends. Perhaps according to them, it would be easier to lie and accept it than showing their self that may have many shortcomings. So also in the presence of teachers. They want teachers to see those who are 'good' in accordance with the expectations of teachers. They try to avoid trouble. By lying they hope I will not punish them because they know that what they are doing is wrong and may disappoint me. For example, when they do not do a job for forgetting, they prefer to answer, "I've done it, Miss, but my book is left at home." That way, they expect me to accept their reason as long as they say they've done it. They are trying to get attention. I can not deny that children on their age, 11 or 12 years, are children who like to look for attention, although one of them by way of lying. For example, when they say, "I'm finished." While they did not really finish it, and just wished me to come to check. When I got to their table, okay, I realized I was just getting rid of it. They try not to hurt other people's feelings. At this stage, of course, not all children do. Only a few children whose way of thinking is much more mature than others. I have never found my student to lie to guard my feelings, except my high school students. From the whole reason why the children are lying, I can conclude that they are lying because they have no other solution or another thing they can do to avoid problems with those around him, including me, their teacher. Or rather they are just trying to find the right way to solve the problems they face. Therefore, I never accused them of lying. But, when I get excuses and excuses that are obviously completely contrived, I think I deserve to be suspicious. Or, when I find my student who promises to finish the job soon, but every time I meet and I remind them they always have an absurd reason, surely my suspicions become bigger. I can take some lessons on how to deal with a lying child. Maybe it can be applied also to the biological child because in fact, they are all essentially the same; children. Do not ask why he is lying. If you are already know that the child is lying, you don't need to ask the reason why they lied. It is a waste of time, they will find more reasons to justify their mistakes. We can immediately ask, for example, because he did not do the task, "What difficulties did you meet while doing the task?" And they will talk honestly. Maybe, they overslept because the whole day before they was playing on Sunday, so do not get to do the job.